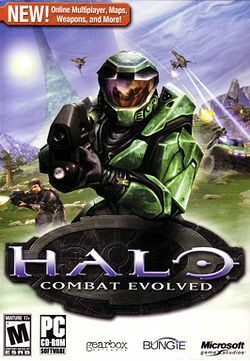 Halo PC refers to the version of Halo: Combat Evolved built for home computers. It was released on September 30 and December 14, 2003 by Gearbox Software and Westlake Interactive respectively. A demo was also released before the PC version. The game demos and videos that were included in the Xbox version were removed from the PC version. To complement the release of Halo PC, a standalone, multiplayer-only custom edition for modding purposes was released on March 15, 2004 by Gearbox Software. Halo PC was one of the most popular online shooters played until November 2004 before Halo 2 was released. Halo PC, for the most part, plays exactly like its Xbox version. As a computer-port, the PC version lacks the ability to play splitscreen in multiplayer and cooperative-play in campaign. It does, however, contain several new features, namely the ability to browse the multiplayer lobby for online matches, direct connection to server via IP address and the ability to run the game in "Safe Mode" (for computers that do not meet the PC requirements). The game comes with several exclusive multiplayer additions such as the six new multiplayer maps which are Timberland, Death Island, Gephyrophobia, Danger Canyon, Ice Fields and Infinity, discarded weapons from the Xbox version which are the Fuel Rod Gun and Flamethrower and vehicles such as the Banshees and Rocket Warthog. In April 2014, it was announced that the multiplayer lobby services of Halo PC and Halo Custom Edition would be rendered unusable by 31st May 2014 with the shutdown of GameSpy's multiplayer servers. In response of the shutdown, a new patch was developed and released by Bungie developer Roger Wolfson (also known as Sawnose) and a small group of Halo fans (Btcc22, Kornman00 and Technut) which will move the soon-to-be-shutdown GameSpy services to a non-GameSpy server. Halo PC garnered mixed reactions and received a score of 83% on Metacritic. GameSpot stated that it was "still an incredible action game ... [and] a true classic", awarding it 9.0 out of 10. It received a score of 8.2 out of 10 from IGN, who stated, "If you've played the game on the Xbox, there's not much for you here." Eurogamer called the game "a missed opportunity", but stated that the online multiplayer component was "a massive draw ... for Halo veterans". Note: Halo will run normally on Intel-based Macs. However, due to having to run in the Rosetta PPC emulator, there is an impact on performance. Halo was originally for the Mac, until Microsoft's acquisition of Bungie, which prompted the Xbox, and later, PC version. The game was intended for use on PowerPC Macs, and will crash if used on a newer Intel Mac. Bungie and MacSoft have since released a patch allowing for universal use of the game. Halo PC has several distinct changes from the Xbox version. The most noticeable one would be the graphics; Jackal shields are no longer distinct to differentiate a Minor from a Major, and do not change color as they get damaged (which were probably problems that the bitmaps and animations were not loaded, from a release-time perspective), stationary shields have a different appearance, the reflection of some weapons reduced their strength, Captain Keyes had different textures, and Shades change as well. Several weapon behaviors have been altered, the zoom feature of a sniper rifle reduced from 10× to 8×. Halo PC (and its demo, which has attracted a large number of players due to its online play, which is limited to the Blood Gulch map and Silent Cartographer level) has remained incredibly popular since its release. In May 2007, over 130,000 players played Halo PC online, nearly 4 years after the game's release. Its popularity with PC gamers continues today. Halo PC can be played without the CD as of Patch 1.08. The key code for Halo PC will unlock visual flair available on Bungie.net for the player in Halo Reach. Several weapons, such as the Fuel Rod Gun, made it to Halo PC, but not the Xbox version. The newly added Flamethrower made its debut in the game.